Sony's new SF-G Series SD cards will let you record your 4K home movie at a good clip. 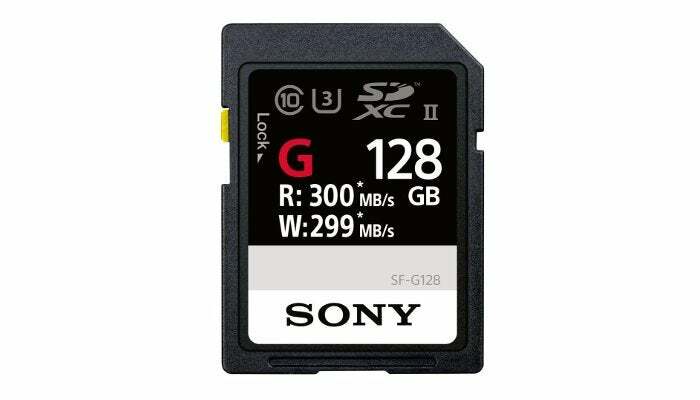 Sony is laying claim to the title of the world’s fastest SD card with its new SF-G Series UHS-II SDXC cards rolling out this spring. The cards will come in 32GB, 64GB, and 128GB capacities, promising write speeds of up to 299 megabytes per second and read speeds of up to 300MB/s. There's no word on pricing, but we’re guessing it’ll be expensive at first. As is typical for high performance SD cards, Sony is aiming this product at the photography market. The SD cards are ideal for hi-speed continuous shooting of high-resolution images for UHS-II supporting cameras and 4K video, according to Sony. The company says its algorithm helps prevent the card’s data-writing speed from decreasing during use for continuous shooting. In addition to the SD cards, Sony is rolling out a UHS-II card reader, the MRW-S1, that uses a USB 3.1 Gen. 1 connection for data transfer. It will also roll out in the Spring. Pricing wasn't announced for that, either. If a user ever accidentally deletes or damages files stored on the cards, Sony’s File Rescue program can try to help retrieve them. The impact on you at home: Sony’s SF-G cards are pretty fast, but the company may not hold onto the title of “fastest SD card” for very long. SanDisk, for example, is right behind Sony’s speeds with SanDisk Extreme Pro SD UHS-II cards offering the same read speeds as Sony, and write speeds at 260MB/s. SanDisk’s cards also come in 32GB, 64GB, and 128GB capacities with pricing starting around $60.